She’s Dominican-born and Miami-raised, she’s queer, and she’s a practicing Buddhist. She’s passionate about intersectional feminism and sociopolitical change. 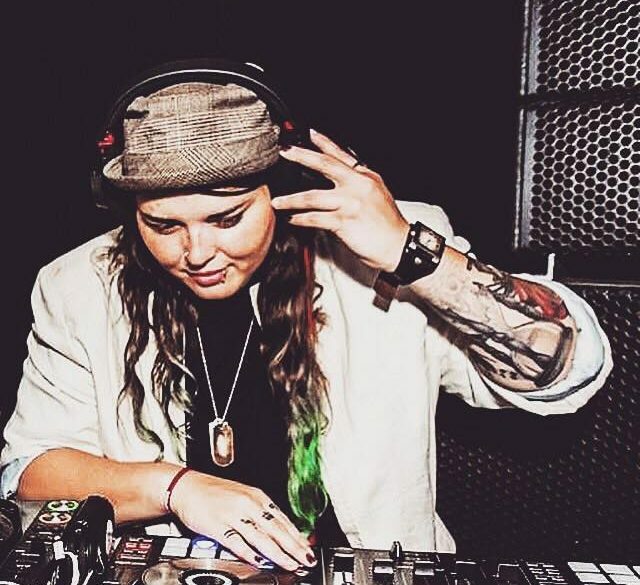 She won the 2018 Dinah Shore DJ battle, and she’s coming to Vancouver for Pride 2018. Her name is DJ Zehno, and we’re so excited to feature her as one of the amazing artists performing at Flygirl’s Pride weekend. Check out our interview with her and learn about her amazing community in Miami, where her work comes from, and what kind of music you can expect to dance to this August. Flygirl: You’re based in Miami—what do you love about playing for Miami crowds? DJ Zehno: I love the Miami crowd because it’s where I grew up. It’s my hometown; it’s where I developed my passion for music. The crowd here is amazing and so is our art and music scene. I have this awesome community that includes close friends and family who have nurtured my growth. They’ve offered immense support, influenced everything I know about music and the industry today. The Miami crowd and I feed off each other because it’s the vibe we all grew up on. The music played in the streets still fuels what I choose to perform, and it’s a beautiful collision of family and art. Flygirl: You’ve performed at many events, and recently you won the 2018 Dinah Shore DJ battle. Did you have a strategy going into that competition? DJ Zehno: I wanted to bring the passion and heat of Miami to Cali—I wanted to transmute that energy through the music, highlighting and marrying those memorable/classic songs from Cali and Miami for two amazing sets. Because of that, I was able to take home first place by both representing my city, and paying homage to Dinah’s state: California. Flygirl: You also host a monthly ladies night called Blend the Femme. Can you tell us more about it? How was Blend the Femme born? DJ Zehno: There are many factors that make Blend the Femme a truly unique event. It started out as a ladies night project my female artist friends and I started back in 2014 in Wynwood, Miami. The art, music, and culture scene was starting to boom there—every month, my team and I changed the event theme, drawing from different ideas and passions. This is the type of gathering that you should experience first-hand to fully understand. Love is so necessary in our world; we honor and encourage the compassion that ensues from feminine energy. We’re in our fourth year now, the events are hosted at various venues to introduce our following and local artists to various scenes like Miami, Fort Lauderdale, and NYC. As a female collective, we hope to inspire communities and encourage creativity, change, and unity. Flygirl: What has been your most memorable gig so far? DJ Zehno: My most memorable gig to date has to be when I performed at Miami Beach Pride for the first time in 2010. At that time, it was the largest crowd I’d ever performed for. I’ll never forget performing in front of one of my idols, DJ Danny Tenaglia. Flygirl: Wow. He’s a legend. There was a moment when, right before he was going to finish his set, he called me back to close the night which was exciting for be because I looked up to him and he appreciated the music I was playing. I still get goosebumps at that memory. Flygirl: What’s a dream club or venue that you’d love to play? DJ Zehno: It’d have to be Pacha Ibiza. Flygirl: Only the most notoriously epic club in the world. DJ Zehno: Yeah! I dream of having the most epic party for Women who Love Women in that iconic Ibiza nightclub! If I’m going to dream, I’m going to dream BIG. This venue is legendary for DJs, it’s truly a staple. Pacha was one of the first of a few nightclubs to highlight DJs back in the 70s. Flygirl: You identify as a practicing Nichiren Buddhist. Can you tell us a little bit about how you began your practice, and how does it influence your life and work? I started practicing Nichiren Buddhism back in November 2013 when I was going through a rough patch. It was around the time my family moved away to different areas and I didn’t really have anyone to talk to. Not long after, one of my friends introduced me to Nichiren Daishonin’s Buddhism, which is based on the Lotus Sutra. It teaches the importance of human revolution or self-transformation through chanting Nam-Myoho-Renge-Kyo. My parents raised me to believe in God and I’ve been baptized and everything, but I’ve never been one for churches if you know what I mean. Flygirl: Yeah it doesn’t always work when parents try to impose their religions on their kids. DJ Zehno: The moment I was introduced to Buddhism, I loved it. It was fully in alignment with my personality and my vision for the world. Karma is real y’all and we have a mission to change this world! Flygirl: You write and talk a lot about intersectional feminism. Why is it so important? DJ Zehno: The reality is that it is not the same for all women. Yes, all women are at risk for gendered violence in the United States, but some women are far more at risk. Even if all women deal with sexism, not all women deal with racialized sexism or transmisogyny, or cissexism. Intersectionality demands that we deliberately look within ourselves at the places that we don’t understand and where we feel challenged. We must collectively take it upon ourselves to learn more about the issues and identities that don’t impact us personally. It’s more than a theoretical understanding of feminism—it’s actually considering how we treat people in our daily lives. Flygirl: How do your Dominican background and adherence to Buddhism inform your work? DJ Zehno: I believe my Dominican background affects everything I do because it’s my culture, it’s who I am and I’m sure you can hear it in my music… Buddhism informs my work by making me aware of the vibes I’m putting out. Cause and effect is a very important part of Buddhism. Every thought, word, and action is a cause we are making and has an immediate effect. I want the message I’m sending to those that follow and listen to my music to be a positive one. Although I do enjoy and play a lot of the mainstream music that is not so “conscious,” I try to perform it with integrity. Thank you for talking with us, DJ Zehno! Make sure to get your tickets for Chicks Ahoy! Boat Cruise on Fri Aug 3 & Hershe’s Pride-closing party on August 5th to see DJ Zehno live! She’ll be spinning alongside other amazing artists such as DJ Sandy Duperval, DJ Dopamine, and Stephanie Rice. Don't miss another Flygirl event, our special offers or a chance to win prizes.